Schooner CASHIER was launched in 1849 at the Duffield Yard in Cedarville, NJ, on Cedar Creek. She was built with a high topmast which extended above the mainmast and allowed a working topsail in light winds, carried the classic clipper bow, and may have carried an extended jib boom. Her masts had a sharp rake or angle to them. She had a counter stern which was replaced with a round profile in the 1930’s due to severe rot in the original. CASHIER worked dredging oysters under sail alone for 66 years (until 1915) when the first of four engines, a 16hp gas plant was installed. Her final engine, a 110hp 4-71 Detroit Diesel, was installed in 1954. During this time period she changed from two masts to one and finally to power only. Her remaining spar was a small stub mast forward to assist the working of dredging gear. CASHIER is the only known surviving example of the "old style" Delaware Bay oyster schooner. 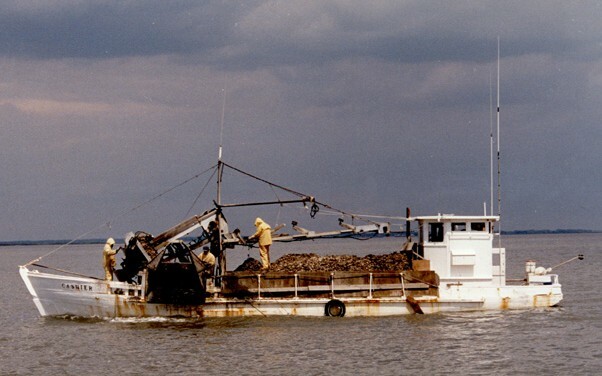 Her primary use during her continuous working life (1849-1999) was the harvesting of oysters. She also had an unknown number of secondary (off-season) uses. Two are documented so far: 1) carrying lumber to the Carolinas and 2) being chartered to take parties for week-long sails around the Bay. A sitting boat earns no money, so other uses can be inferred. CASHIER is a vital link to the spirit and heritage of Delaware Baymen going back almost to colonial times. Her first owner and crew would have family memories of events such as the Greenwich Tea Party. In 1849 there were only thirty states and Harriet Tubman made her escape from slavery. Stone knives and bearskins: CASHIER restoration crew removes antique object of unknown purpose from hold to lighten ship. Photo by Greg DeCowsky. A company of our citizens, with some two or three from Cedarville, left the latter village for a cruise down the bay. The following extracts, from the Log, will tell what they saw. Log of the Schooner “Cashier,” Capt. David Sheppard. Left Cedarville with a slight head wind on the 25th of July, at 7 _ pm. Considerable trouble getting down the creek, ‘till within some 2 miles of the mouth, when a good breeze sprang up, which soon carried us to the mouth, when we anchored in consequence of a squall from the NW, which billowed itself out by 2 am of the 26th. 5 _ am of the 26th, sailed for the cove wind NW. Passed Fortescue at 6 _am. Passed Egg Island Light at 6:45 am. Caught our oysters, which were the finest we had seen at this time of the season, and commenced fishing at 7:45 am in the cove. Trout bit well and run very large. Mr. A.A. Evans, of your city, taking the lead with the first fish. All did well. One man sick. At 10 am underway for the Breakwater. Passed 2 Southern Steamers at 12 _ pm. 12:45 passed Brandywine light. 1 pm calmed and drifted with the ebb tide to the Breakwater, catching a 150 pound shark by way of variety. Arrived at Breakwater at 5 _ pm. On the 27th visited Lewistown, Delaware, which, of all the places has fewer attractions than any place we ever visited. The Delaware railroad has been extended to Lewistown, where they have erected a railroad pier into the Bay, some 1600 feet long. It is at this point they wish to ship the peaches, and crossing the Bay, connect with the Bridgeton and Port Norris railroad, thus reaching New York much sooner than by the old route. We hope it will be effected, as the trade would count something for our enterprising railroad men of Cumberland County. At 1 pm set sail for Cape May, which we reached at 3:10 pm. Visited the Island in the evening, and saw the 5th Maryland Regiment S.N.G., which was reviewed by Gens. Meade and Patterson. Returned at 11 1/2 pm All well. On the 28th visited Cape May light house, which is 150 feet high from the sea level, and is reached by 218 circular steps. The light is what is termed revolving, to distinguish it from that at Cape Henelopen. It was placed there in 1854, and can be seen at ordinary times from 20 to 25 miles at sea. Also visited the English yacht Osprey, owned by J. E. Peters, Esq. She is a sloop 72 feet long, and 15 feet beam, and 9 foot hold, and commanded by Capt. Loverett. She had left England on the 2nd of April, has sailed along the coast of Spain and Portugal: thence along the coast of Africa, Madeira and Tenerif; thence to the Bermudas, then to Norfolk and the Capes of the Delaware. Her owner intends to visit New York and Boston, and then sail for England by way of New Foundland. Her saloon had a large library on either side, with quite a collection of curiosities gathered on the trip. She was nicely carpeted and had hot and cold water &c; in short, “a house.” with all the modern improvements. Their time was English, vis., 3:24 pm, ours 9:17 am at the time of our visit. At 1 pm sailed for the cove: splendid breeze. Caught more fish and oysters and laid at East Point that night, it being quite stormy. On the 29th sailed for Fortescue, after fishing, and arrived at 4 _ pm. Went ashore and had a good time at the house. On the 30th sailed for home, and arrived at the wharf at 10 _ am, all in good health and spirits, and in good condition to go again. After dinner, a series of resolutions were passed; expressive of out thanks to Capt. Sheppard and crew, for their kindness and attention to the party, after which we adjourned, sine die, at 12 pm. This web page is dedicated to our loyal and courageous shipmate, Capt. Agnes J. Meerwald (Ret. ).